Detroit is a dark place now, unemployment is high, water and electricity are being cut off, people are suffering. It makes sense that death metal from the area would be brutal, doom filled, and oftentimes terrifying. 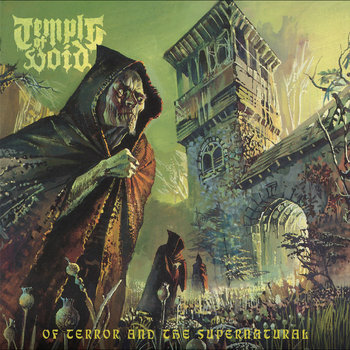 Temple of Void are all that and more, their new LP, Of Terror And The Supernatural is 8 tracks of bottomless horror. With growls that are twisted and evil, truly stellar guitar lines, and some great songwriting, this is the kind of thing that keeps you up at night. There is a wonderful sense of antediluvian terror that permeates this record and winds its way into your mind, slowly driving you insane. In other words, within just a few minutes of listening it's easy to see that Temple of Void get what doomy death metal is about, and they are going to ram it down your throat. These riffs are too good to ignore, and the sheer vibes are out of this world. Let the savage howl of this band carry you away to rot in solitude beyond the ultimate. Temple of Void will tear you apart then embalm the remains while you bargain with death.